How to Wash Workout Clothes | Valet. Photographer and travel blogger John Philp Thompson wears the All Over Short ($68) and Convoy Tee ($68) by Olivers. It seems like we're living in the golden age of fitness attire. The clothes we wear to the gym are now extremely lightweight and comfortable. They're cut from stretchy, space-age materials with laser-cut ventilation and the fabric itself was engineered to draw the sweat away from our bodies. But therein lies trouble with these impressive performance clothes—they're too advanced for our old fashioned laundry techniques. 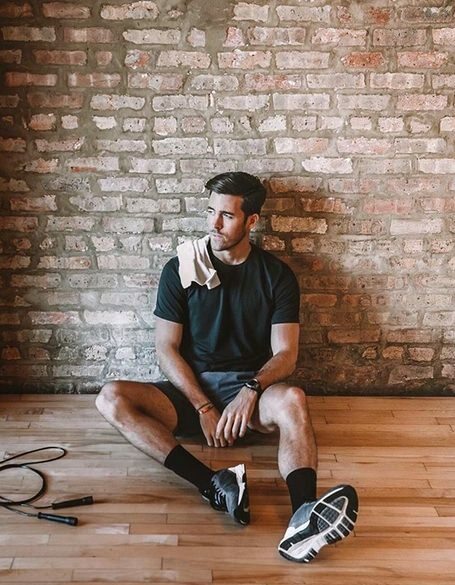 If you're noticing that your workout gear isn't coming out of the wash smelling fresh, then you might need to make some adjustments on laundry day. Herewith, four tried-and-true methods to keep your athletic clothes looking (and smelling) their best. Your sweat and deodorant can build up on the inside of the clothing (trapping bacteria that will eventually start to stink). Flipping them inside out ensures the dirtiest parts will get the most rigorous washing. 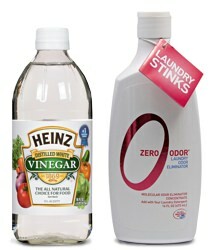 Add an odor-eliminator to your load of laundry. One that you might already have on hand is simple white vinegar. Just pour a quarter cup of vinegar into the bottom of your washer with your regular detergent before you throw in your clothes. It naturally kills off any odor-causing bacteria. And while nearly all of the vinegar smell washes away, if you're not into it, you could try a specially made product like Zero Odor. Try a special sport detergent. If you've got serious locker room smells coming from your athletic gear, then you may need a detergent made especially for performance fabrics. These soaps are formulated to kill bacteria and remove built-up deodorant and body oils that cling to synthetic fabrics. 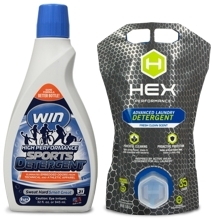 Two that we really like are Win Sports Detergent and HEX Advanced Laundry Detergent. If you're just in the habit of tossing in some fabric softener with your wash, let this be a warning to STOP. Fabric softener is kind of like conditioner for clothing, and it doesn't work well with performance fabrics. It leaves behind a coating that can interfere with the sweat-wicking properties of the material and will ultimately gunk up your workout clothes. Three exercises to add some bulk and definition to your arms.